Photo by Elin Schoen Brockman. Livorno sits on the westernmost edge of Tuscany, its grand harbor opening onto the Ligurian Sea. It is a city of broad boulevards lined with post-Renaissance buildings and a system of fossi, canals, bridged, at one point, by Piazza della Repubblica, said to be the widest “water square” in EuropeIt is also a city where, during the course of a half-hour stroll, you can encounter a Greek church, an Armenian church, a monument called The Four Moors and a glaringly modern synagogue. And the Jewish “nation” was one of Livorno’s most distinctive and distinguished. There was never a ghetto here. Livornese Jews were free to become leaders in commerce and industry as well as in the arts and publishing. Their dialect, Bagitto, a potpourri of Hebrew, Spanish and Livornese Italian, left its mark on the local idiom; their cuisine featured couscous and other North African, Spanish and Portuguese delicacies found nowhere else in Italy. Foreign dignitaries, even heads of state, made a point of visiting the magnificent neo-Classical synagogue that was in the heart of the city and said to be second only to Amsterdam’s in sheer splendor. That synagogue was destroyed by Allied bombs in 1944. After the war, according to Gabriele Bedarida, director of the community archives, “there was no money to restore it the way it was; people were hungry.” The present Tempio Maggiore of Livorno was dedicated in 1962 on the same spot as its predecessor. Its strange singularity—it is the only modern synagogue in Italy—perfectly reflects the singularity of Livorno and of its Jewish life and culture, past and present. The ‘Four Moors.’ Photo by Elin Schoen Brockman. But this extraordinary document, called La Livornina (now in the Dewey Library at the University of Pennsylvania), was meant mainly to attract Jews and Conversos who had fled Portugal and Spain and had helped to make Venice and Ancona flourish by guaranteeing that in Livorno—unlike in Venice and Ancona—“none shall be able to make any inquisition, inquiry, examination, or accusal against you….” In Livorno, Conversos could return to Judaism and they, as well as other Jews, would be Tuscan citizens with full religious freedom and autonomy. 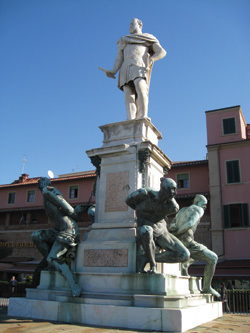 Historians point to Medicean Livorno as a social, not just an economic, experiment. By 1689, the 3,000-some Jews in Livorno included not only merchants but people from all walks of life. During the entire period when Jews elsewhere in Italy were segregated from the rest of the population and reduced to dealing only in secondhand goods, Livornese Jews could live where they pleased and deal in any commodity except secondhand goods. One of the first of these entrepreneurs was Maggino de Gabriele, who opened his glass factory in 1593 and went on to manufacture silk and wool. He soon had plenty of competition in textiles; one Jewish manufacturer landed the cotton monopoly for all of Tuscany. Other Jews prospered in the soap, sugar, tobacco, paper and coral trades, and as scholars, physicians, writers and publishers. But it was the brilliant traders whose ships dominated commerce throughout the Mediterranean, Northern Europe and the Far East who made the Jews indispensible to the Medici, so much so that, according to a popular saying, it was less perilous to lay a hand on a grand duke than on a Jew. Ironically—or perhaps not so ironically, considering the uniqueness of this situation—the Napoleonic conquests at the close of the 18th century, which brought down ghetto walls elsewhere in Italy, signaled the decline of the golden age of Jews in Livorno. “Liberty, Equality, Fraternity” meant that the privileges they enjoyed under ducal rule were rescinded; the economy, over which they pretty much held sway, tanked in the wake of the British blockade of Italian ports spurred by Napoleon’s campaign to strangle British trade. An homage to Modigliani at the Livorno train station. And another golden age began—this time of flourishing intellectual life. The community produced some of the major Jewish political and cultural figures of the 19th and early-20th centuries, including Sir Moses Montefiore; the liberal theologian and mystic Rabbi Elijah Benamozegh; the socialist senator Emanuele Modigliani and his brother, the artist Amedeo Modigliani; Sabato Morais, who founded the Jewish Theological Seminary in New York; and the opera star Mario Ancona. After World War II, only around 1,000 Jews remained in Livorno. The decision to replace rather than restore their fallen temple was difficult and controversial, but in retrospect it appears inspired. Many of Italy’s synagogues were built in the wake of the ghetto period as symbols of survival; Tempio Maggiore of Livorno, where there never was a ghetto, is the only Italian synagogue that is an architectural declaration of survival after the Holocaust. 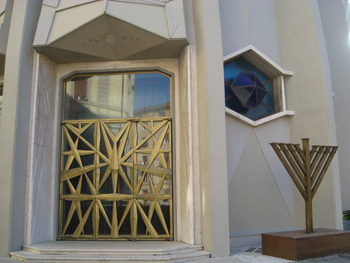 Very few of the approximately 700 Jews in Livorno today are of Portuguese and Spanish descent; in addition to both Sefardic and Ashkenazic families that originated elsewhere in Italy and Europe, there are now many Libyan Jews, including Samuel Zarrugh, the current president of the community. The chief rabbi, Yair Didi, is from Israel. Among other prominent Jewish residents are the historian Gabriele Bedarida, who heads the community archives, and Guido Guastalla, owner of Belforte Editore Librai (Via Roma 43; 011-39-0586-808730; www.libreriabelfor te.it). This legendary bookstore and publishing house, founded in 1805 and known internationally for its magnificent prayerbooks, closed during World War II. In 2001, Guastalla revived his family’s business; current titles include Dalle Nave e Degli Uomini, a memoir by the Livorno-born National Institutes of Health scientist Giacomo Nunez in which his seafaring Sefardic family’s adventures cast a revealing new light on Livornese Jewish history. Tempio Maggiore, outside and inside. Photo by Elin Schoen Brockman. Tempio Maggiore is located at Piazza Elia Benamozegh; the community offices (39-0586-896290; http://moked.it/livornoebraica), including the archives, are in the adjacent building. Visitors are welcome at weekday and holiday services, which are held in the Italian rite. The community offers Hebrew and Talmud classes as well as other educational activities for children and adults. Organizations include the local chapter of the Association of Jewish Women in Italy, Young Jews of Livorno and Keren Kayemeth LeIsrael. Arcade-graced Via Grande runs straight from Piazza della Repubblica through the city’s hub, Piazza Grande, to the spectacular port, one of the busiest in the Mediterranean, teeming with freighters, ferries, cruise ships, ocean liners and yachts. But you still get a strong sense of the days when all the ships had sails as you take in the refrigerator-magnet-ready scenes all around you—especially the Medicean fortress looming over the fishing boats in the Darsena Vecchia (ancient port) and the mammoth statue named for the four Moors, who are depicted groveling at the feet of Ferdinando I, rather than for the Medici duke himself. Yeshiva Marini. Photo by Elin Schoen Brockman. Not far from the north end of Piazza Grande (where you will find the Duomo and buses to everywhere in Livorno) is Via della Madonna, which will take you into canal-crossed Quartiere La Venezia, a district so visually romantic that Luchino Visconti re-created its melancholy rhythms of water, light and shadows for his 1957 film White Nights. In the 17th and 18th centuries, the wealthiest merchants, many of them Jewish, lived and worked here; barges brought their merchandise from the port to their canal-level storerooms. Today, the brokerages and warehouses have been replaced by hip restaurants, bars, galleries and antique shops. Via Borra—embassy row in the 1800s—is still one of Livorno’s most elegant streets. On the other side of Piazza Grande, a short distance past the Duomo, is Tempio Maggiore, a leviathan of a building with an elliptical, ribbed façade and porthole-like windows, right in step with the seafaring spirit of Livorno. Inside, however, the spirit of Moses’ tent—which was actually what inspired architect Angelo di Castro—prevails. 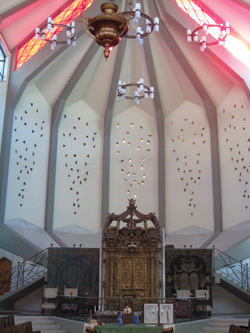 The soaring, light-filled space and amphitheater-style seating play counterpoint to a monumental gilded-wood Baroque Ark from the old Spanish synagogue in Pesaro, located in the Marche region east of Tuscany. Two elongated red windows set overhead like a stark canopy evoke the blood shed by the Jewish people throughout history. Contact the community offices to visit the synagogue. When Allied bombs ruined the much-loved neo-Classical temple, its museum—the first Jewish museum in Italy—was also badly damaged. 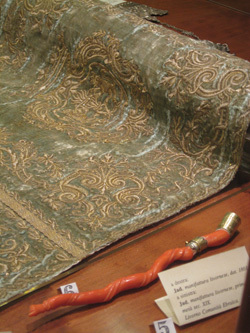 But many surviving treasures are on display in the Museo Ebraico Yeshiva Marini at 21 Via Micali, where religious services were held until the present synagogue was built. This small but fabulous collection includes exquisite Livornese textiles (local Jewish women were famous for their embroidery) and ritual objects in coral and silver as well as Judaica from Venice, Rome and Florence, Holland and North African countries. To visit the museum, contact Amaranta Service (39-0586-839772; www.amarantaservice.it). Amaranta also provides guided tours of Casa Modigliani (Via Roma 38); the house where the artist was born and grew up is now equal parts museum and shrine with letters, photos, other artists’ tributes to “Modi” and reproductions of some of his works. But two original Modigliani drawings as well as Small Tuscan Landscape, which he painted when he was 14 years old, are in the Museo Civico Giovanni Fattori (Via S. Jacopo in Acquaviva; 39-0586-808001; http://pegaso.comune.livorno.it), where pastoral and Risorgimento battle scenes by Giovanni Fattori and other artists of the 19th-century Macchiaioli school predominate. While there, don’t miss the charming Landscape with Cows by Serafino de Tivoli, a Livornese Jew who fought with Garibaldi in some Risorgimento battles. Every painting in the room named for Ulvi Liegi (born Luigi Mose Levi in Livorno) shows his brilliant way with color, a lot of it local; his Interno della Sinagoga, painted in 1935, captures the very soul of the old Livorno synagogue where he helped establish the Jewish museum. In the room devoted to Vittorio Corcos, who came from a middle-class Livornese Jewish family and became one of the leading portraitists of the belle epoque era, you will find his iconic paintings of Garibaldi and Yorick. 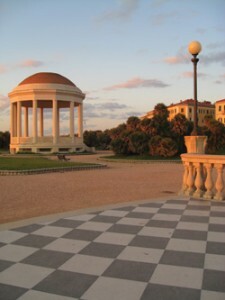 The black-and-white pavimento at the Terrazza Mascagni. Visit the museum in late afternoon, then wander or take a cab over to Terrazza Mascagni, a glorious, sprawling seaside promenade. There you can take in the surreal experience of watching the sun sink over the island of Capraia as couples of all ages stroll the black-and-white pavimento or lean, entwined, on the endless stone colonnade while ships turn to silhouettes on the horizon and fishermen cast longer and longer shadows on the beach below. The No. 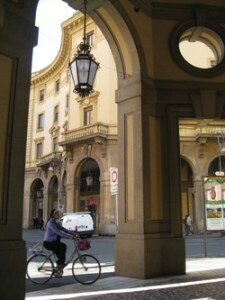 1 bus, which makes a stop nearby on Viale Italia, will take you back to Piazza Grande. Pisa is only about 20 minutes from Livorno by train and, as long as you are in the neighborhood, it would be a shame to miss the Leaning Tower—and the Sinagoga di Pisa (Via Palestro 24), which dates from the 16th century and was renovated in 1863 by Marco Treves, famous for his synagogue architecture. For several years, it has been in restauro because of serious water damage. Meanwhile, not far from the Leaning Tower is the Jewish cemetery, one of the world’s oldest (Jews first settled in Pisa in the ninth century). To visit the cemetery, contact the Comunità Ebraica di Pisa (39-050-542580; www.pisaebraica.it). The title of this Francesca Trivellato book says it all: The Familiarity of Strangers: The Sephardic Diaspora, Livorno, and Cross-Cultural Trade in the Early Modern Period (Yale University Press). You won’t find a more thorough or compelling account of the global impact of Jewish merchants in 17th- and 18th-century Livorno. For a quick but comprehensive look at Livornese Jewish culture—plus cuisine—read the chapter on the city in Tuscany Jewish Itineraries (Marsilio) by Dora Liscia Bemporad and Annamarcella Tedeschi Falco. Gardens and Ghettos: The Art of Jewish Life in Italy (University of California Press), edited by Vivian Mann and published in conjunction with The Jewish Museum of New York’s landmark 1989 exhibition, is still the best—and most beautiful—book about Italian Jewish art and artists, including Modigliani, Ulvi Liegi and others from Livorno. 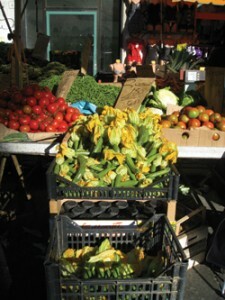 Vegetables for sale at the Mercato Centrale. Lose yourself in the cavernous, skylit neo-Classical Mercato Centrale near Piazza Cavour. The food hall contains fresh fish displayed like precious jewels; stall after stall selling pane zibibbo (a delectable raisin bread), schiacciata (the local focaccia), chickpea biscotti and other Livornese delicacies; sellers of antique kitchen gear, an old-fashioned watchmaker and a vintage bar with chrome footrests where you might need to fortify yourself with some ponce, the famous local rum and espresso punch. Outside are produce, clothing, buttons and trimmings, and, at Via del Cardinale, the Antica Torteria al Mercato di Gagarin, a hole-in-the-wall take-out where everyone goes for the best Torta di Ceci sandwiches (a sort of chickpea polenta, sliced thin and fried) in town. Ask for a Cinque e Cinque (Five and Five), which originated as five-lira worth of torta stuffed into an equal quantity of bread. Gennarino, a restaurant not far from the market at Via S. Fortunata 11 (39-0586-888093; www.ristorantegennarino.it), features such classic Livornese seafood dishes as cacciucco (a fish stew). La Vecchia Senese (Largo Duomo 13; 39-0586-892560; www.lavecchiasenese.com) —right near the synagogue—has a wide variety of fish specialties and the pizza list includes quite a few vegetarian choices. There is a kosher bakery, Panificio Lo Giudice, at Via delle Commedie 9 (39-0586-894532). For rooms with fabulous water views try the Hotel Gran Duca at Piazza Giuseppe Micheli 16-18 (39-0586-891024; www.granduca.it) across from the harbor. In the charming Hotel al Teatro (Via Mayer 42; 39-0586-898705; www.hotelalteatro.it), within easy walking distance of most major sights, rooms are named for Italy’s greatest composers. For capsule descriptions of sights and scenes as well as plenty of practical advice on shopping, dining, current events and getting around, go online to www.livornonow.com. Also online is www.J-Italy.org, a collaborative effort of the Centro Primo Levi, the Union of Italian Jewish Communities and ENIT–the Italian Government Tourist Board, that offers essays by top scholars on virtually every aspect of Italian Jewish history and culture. Eventually it will include a visit to all the places in Italy where Jews live or have lived. Livorno is already there. 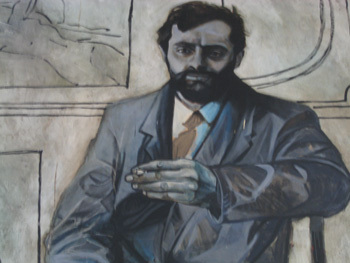 If you find yourself in the Livorno train station, be sure to check out Omaggio ad Amedeo Modigliani, a stunning portrait of the artist signed con affetto by Alessandro Bulgini. In another Italian train station, you might find a tribute to a saint; here, it is to the most celebrated Italian artist of the 20th century, reminding us that this was his hometown. Elin Schoen Brockman’s Web site is www.elinschoenbrockman.com.